3 Easy Ways to Get Your Kids Moving! The Gymnastics and Cheerleading Academy of Cherry Hill (“The GCA”) offers a variety of physical activities for children ages two (2) through (13). 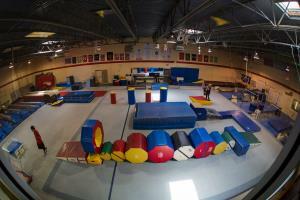 We host birthday parties and special events; have a flexible summer sports camp; gymnastics classes, cheer and tumble programs, parkour ninja classes, and team programs. Our 12,500 square foot indoor facility is fully air-conditioned offers laser-tag, zip-lines, in-ground trampolines, in-ground foam pit, large spring floor, climbing ropes, and more to ensure kids can stay dry on rainy days and cool during the summer heat. Our fenced-in outdoor area has canopied areas to ensure children do not spend all day in the sun and features two in-ground swimming pools, in-ground trampolines, playground and sandbox, ninja obstacle course, archery field, 30 foot slip n’slide, arts and crafts area, gaga pit, and a large sports field. Our Super Star Summer Camp is a staple in the South Jersey and we are considered the premier summer day camp for the area. Our New Jersey State Approved Youth Camp runs from June 20th through August 26th for boys and girls ages 3 through 13. Our flexible enrollment program includes one (1) week sessions with a 5, 4, 3, or 2-day attendance options, including half and full day options for younger children. Registration for Spring 2016 classes and Summer Camp 2016 is available online. To learn more check out our website and Facebook or contact us at 856-795-4599. We invite you to learn more, in-person, by attending one of our Camp Open Houses (April 16th from 11 a.m. to 3 p.m., April 28th from 5 p.m. to 7 p.m., or May 28th from 11 a.m. to 3 p.m.) or scheduling a private tour.